My family has a long history of serving in the military. Being a military member myself and a military spouse I feel a close connection with my military ancestors. That connection has led me to some fascinating forays into the quest for military genealogy records. Over the past two years I have focused on locating military records for many of my ancestors. Footnote.com has a terrific collection of Revolutionary war and civil war records, which I have found several pertinent records in. For more recent wars I have contacted the National Archives. 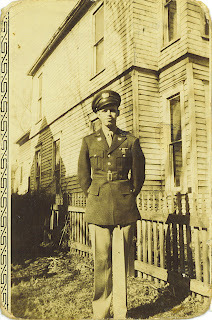 My first exploit in military records was attempting to find the records of my grandfather, Leroy C. Kuhn. I never had the opportunity to meet him, but I knew he had served in the military because he was buried in Leavenworth National Cemetery and was an active member of the Veterans of Foreign Wars. In a search on Ancestry.com I found his enlistment record in the U.S. World War II Army Enlistment Records, 1938-1946 collection. It stated that he enlisted as a private in the Army's medical department on 25 July 1940 in Leavenworth, Kansas and would serve in the Philippine department. For my grandfather's records I had my father put in the request. The eVetsRecs System is very easy to use, simply launch the program and it walks you through the steps to order the specific records you need. It is helpful to have the following information on your veteran: Full name, branch of service (Army, Navy, Marines, etc. ), Service Unit (whether the veteran was active component or reserve), Social Security number, Date of Birth, Place of birth, Service Number, whether the veteran was an officer or enlisted and the approximate date that the veteran left the Service. Much of this can be found on an enlistment record, but don't worry if you don't have all the information, the NARA will conduct the search on what you have. The eVetsRecs System provides a signature verification form which the next of kin must sign and then mail to the address listed on the form. Keep of copy of this document so you will have a record of your request. We actually made two requests: one for my grandfather's active-duty Army service and one for his Naval Reserve service. Both requests were made on 23 June 2009. We received a response for our Reserve component request on 14 July 2009. The packet included a copy of his navel reserve enlistment contract and his naval reserve service record. I received the copy of my grandfather's active-duty Army records 1 November 2009, about four months after I made the request. The packet included his report of separation, a copy of his discharge papers and a statement of his service. His service file was not very robust, but did have important information in it that I did not already have such as the names of the units he was assigned to. This information will help me to track down the type of war action my grandfather saw, if any. The most difficult part in requesting military records is the wait, but that is something genealogists must, by necessity, be good at. 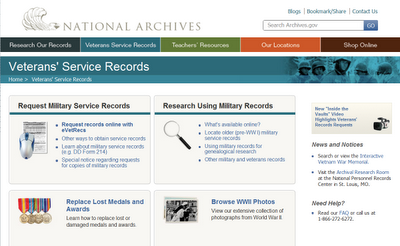 Take the opportunity to make the request and you may find a wealth of information on your military ancestor.